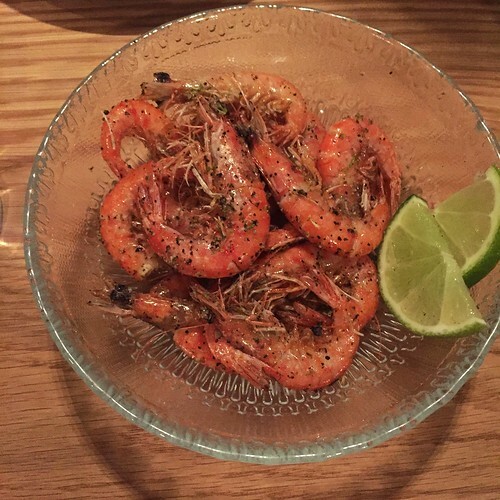 To start: whole fried shrimp with salt and pepper…a perfect bar snack to pop into your mouth, head, legs and all, while drinking a refreshing beer or cocktail. Crunchy and heavily seasoned, brightened with a squeeze of lime. 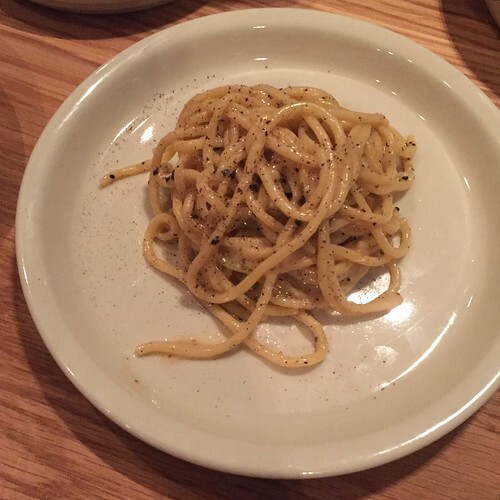 Instead of getting any protein-heavy dishes (the brisket had run out by the time we arrived), we ordered a number of pastas, including the much-hyped ceci e pepe with chickpea hozon and black pepper, a funky take on the classic Roman pasta. Here, the usual pecorino cheese is swapped for a chickpea miso-esque substance that doesn’t skimp on the umami and maintains that velvety texture. It looks super simple on the plate but don’t expect it to be bland. One of my favorite dishes of the evening, Nishi’s Asian take on chicken and dumplings. It was a lighter version of the Southern comfort dish, with strong hits of toasted sesame oil, wide flat noodles and meaty, smoky shiitake mushrooms. 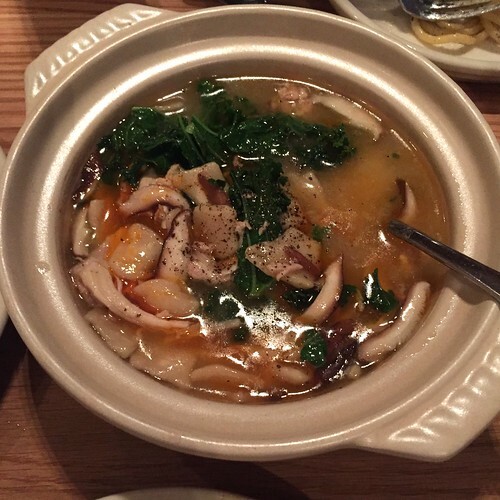 It reminded me of the minimalist, medicinal soups that my mom and dad would prepare when my sisters and I were young, consisting mainly of a milky bone broth made pork back bones, sesame oil and other Asian ingredients like goji berries and ginseng. Here, clams grand lisboa, a potentially great dish that was unfortunately way over-salted on our visit (and I tend to like a lot of seasoning). 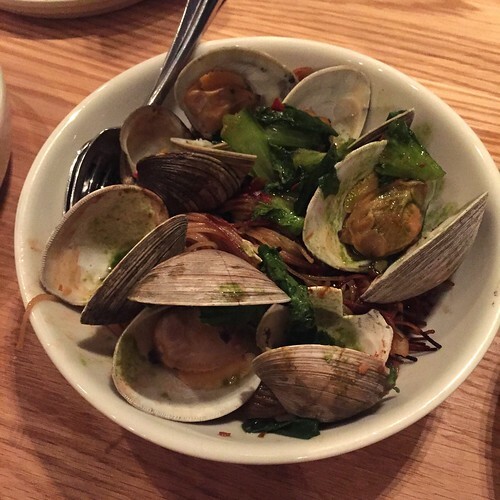 Topped with tender clams, the noodles were cooked like Spanish fideos or Cantonese pan-fried noodles, with crunchy, almost charred noodles around the perimeter and heavily sauced, softer noodles in the middle. At some point, I’d like to try a better executed version of this dish because it has everything that I like – briny seafood, lots of different textures and an interesting sauce. Our final pasta dish, spicy beef Sichuan noodles, a decent dish but not particularly memorable. It evoked a hybrid of pappardelle bolognese (and looks a lot like it too) and the addictive sauce in the spicy pork sausage and Chinese broccoli dish at Ssam Bar but didn’t have as much of a kick as I would’ve expected from a dish labeled “Sichuan”. 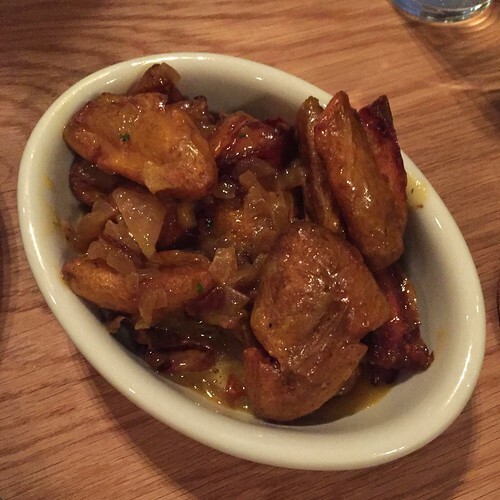 We also tried the fried fingerlings with smoked yolk and tarragon and while the sauce was delicious, I didn’t really care for the large, thick chunks of potato, which were missing that crispy exterior and creamy interior that I look for in any fried potato dish. Dessert, however, was delicious and wonderfully simple. 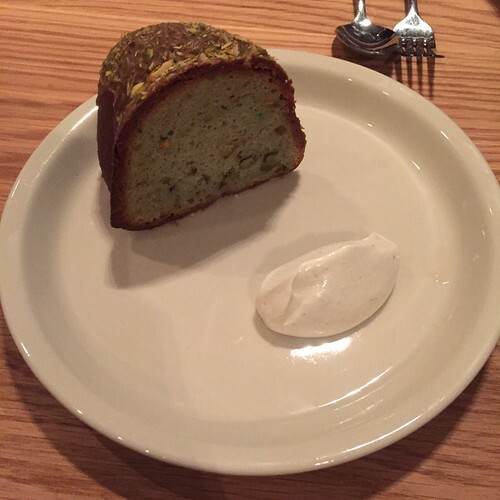 We ordered the pistachio bundt cake with ricotta because everyone had been raving about it and it was a lovely, not-too-sweet slice offset by the tangy cream. So many carbs in one meal…in the end, while I was happy to have tried this cross-cultural restaurant, it will be a while before I feel the need to go back. 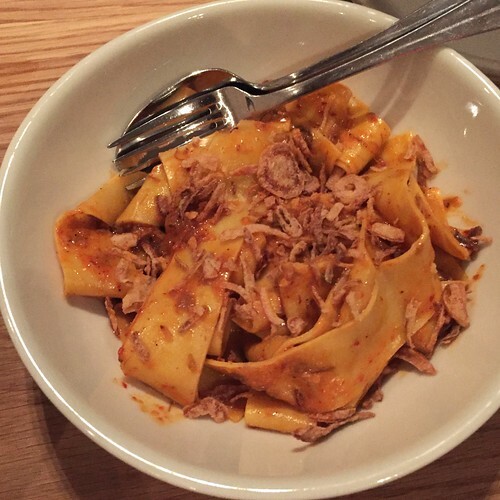 You are currently reading Momofuku Nishi at Notes on Food.